Armenia is the first country in the world to adopt Christianity as a state religion in 301 a.d.
Day 1: Arrival – Check in – Overnight in Yerevan. Day 2: City Tour – Matenadaran – Charents Ark – Lunch – Garni Temple – Geghard Monastery – Yerevan. After breakfast starting city tour: Republic Square, Opera and ballet house, Cascade. Visiting Matenadaran. The Mesrop Mashtots Institute of Ancient Manuscripts is a repository of ancient manuscripts, research institute and museum located in Yerevan, Armenia. It holds one of the world’s richest depositories of medieval manuscripts and books which span a broad range of subjects, including history, philosophy, medicine, literature, art history and cosmography in Armenian and many other languages. Drive to Charents Ark. Charents was an Armenian poet, writer and public activist. Lunch in habitat house. Garni Temple was built in the first century A.D. by the Armenian King Tiridates and it is dedicated to a heathen god, probably to Mithra, the god of the sun whose figure stood in the depth of the sanctuary. 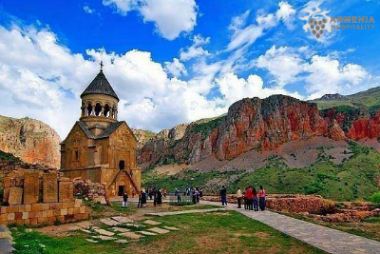 Higher up the gorge of the Azat river, there is a magnificent monument of medieval Armenian architecture Geghard monastery inscribed in the UNESCO World Heritage list. Geghard is another incredible ancient Armenian monastery, partly carved out of a mountain. Back to Yerevan. Overnight and dinner in Yerevan. Mass in the ruins of a church in Garni or in the garden. You have to have table wear, glass, candle, wine, water because it is outdoor (depending the weather). Day 3: Yerevan – Genocide Museum – Zvartnots Cathedral – Echmiadzin – Ararat Brandy Factory – Parajanov Museum – Dinner. Echmiadzin .The Church was built between the years 301 – 303 AD under the Armenian king Tiridates III and the first Armenian Catholicos, St. Gregory the Illuminator. Lunch in Echmiadzin. After lunch back to Yerevan . Visiting famous Ararat Brandy Facory. Ararat Brandy Factory is the leading enterprise of Armenia for the production of alcoholic beverages. Its main brand name is Ararat. Walk around the ageing cellar and see how the brandy spirits are preserved, know who have nominal barrels and enjoy the delicate aroma of the cellar. Pass a pleasant and memorable time in the tasting hall enjoying the delicious “THREE STARS”, “AKHTAMAR”. Visiting Parajanov Museum . Overnight and dinner in Yerevan. Meeting with Father Partev Apostolic Priest at the Church of the Holy Mother of God Apostolic Church near Edjmiatzin. Mass in the church. Day 4: Yerevan – Amberd Fortress – Saghmosavank Monastery – Alphabet Park – Yerevan – Dinner. After breakfast driving to Amberd. The principal architectural features of medieval fortress-building have found their reflection in this fortress. 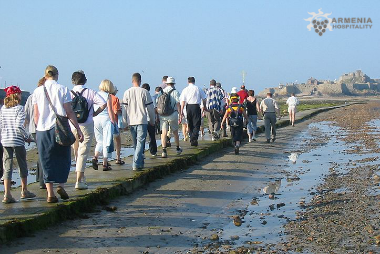 Having been built on a naturally well-defended cape, Amberd has for long time served as an important military fort. Next to this secular edifice there is a church built in 1026 by the duke Vahram Pahlavuni.Saghmosavank. 5 km far from Hovhanavank monastery on the edge of Kasakh river canyon, in the 13th century Vachutian dukes built Saghmosavank monastery. The main church is adjacent to the scriptorium, where many manuscripts have been produced during centuries. Saghmosavank underwent the devastating influence of the earthquake in 1988. The reconstruction comleted in 2000 returned the church its beauty and glory.Armenian alphabet monument” is located in the village of Artashavan, at the east side bottom of Mt. Aragats. It was erected in 2005 to the 1600 anniversary of creation of the Armenian alphabet by the design of the famous Armenian architect Jim Torosyan. Originally it contained 36 letters and had been completed in the Middle Ages. Overnight and dinner in Yerevan. Mass in the chapel of the Seminary of Mekhitarist priests. The Mekhitarist: Armenian congregation of Benedictine monks, founded in 1701 by an Armenian Catholic theologian, Mekhitar of Sabaste. Day 5: Yerevan – Khor Virap Monastery – Noravank Monastery – Lunch – Areni Winery – Yerevan – Dinner. After breakfast drive monastery complex of Khor Virap – the place of imprisonment of St. Gregory the Illuminator, who stayed here in the small dungeon for 13 years without any food, accused by the Armenian King of preaching Christianity. Here is also the closest and most spectacular view of the gorgeous biblical mountain Ararat shining with its two white peaks. Noravank is a 13th-century Armenian monastery, located 122km from Yerevan in a narrow gorge made by the Amaghu river, near the city of Yeghegnadzor, Armenia. The gorge is known for its tall, sheer, brick-red cliffs, directly across from the monastery. Lunch in Noravank. Areni is a village in the Vayots Dzor Province of Armenia. It is best known for its wine production, although the majority of wine produced locally is from the nearby village of Getap. Tasting Areni wine. Drive back to Yerevan. Overnight and dinner in Yerevan. Mass following the meeting in the chapel of the Sisters of Mother Teresa. The sisters of Mother Teresa of Calcutta work in Armenia since 1989. Day 6: Yerevan – Lake Sevan – Sevanavank – Lunch in Sevan – Dilijan – Dinner. After breakfast driving to Sevan. 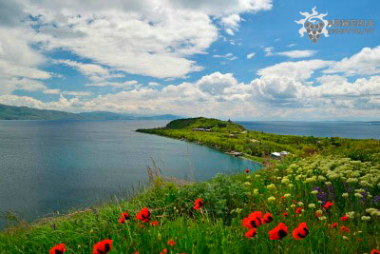 Lake Sevan is the largest lake in Armenia and the Caucasus region. It is one of the largest freshwater high-altitude lakes in the world.Lake Sevan is situated in the central part of the Republic of Armenia, in the Gegharkunik Province, at the altitude of 1,900 m (6,200 ft) above sea level. Lunch in Sevan . 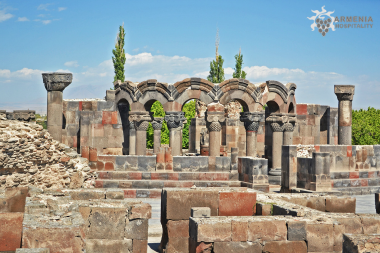 Sevanavank is a monastic complex located on a peninsula at the northwestern shore of Lake Sevan in the Gegharkunik Province of Armenia, not far from the town of Sevan. Initially the monastery was built at the southern shore of a small island. Dilijan is a spa town in the Tavush Province ofArmenia. Usually called Armenian Switzerland or Little Switzerland by the locals, it is one of the most important resorts of Armenia,situated in Dilijan National Park. The forested and reclusive city is home to numerous Armenian artists, composers, and filmmakers and features some traditional Armenian architecture. Overnight and dinner in Dilijan. Meeting with the priest of the Armenian Apostolic Church in Sevan and seminarians. The group meet the seminarians and apostolic Father Sevanavank. The seminary was founded by Catholicos most beloved Armenians Vazgen I, the seminarians are studying there for 4 years. Sometimes at the end of meeting, the choir of seminarians sang for the group (It depends on the time available and the availability of seminarians.). Day 7: Dilijan – Haghartsin Monastery – Sanahin Monastery – Haghpat Monastery – Yerevan. After breakfast in Dilijan driving to Haghartsin. Haghartsin is a 13th-century monastery located near the town of Dilijan in the Tavush Province of Armenia. It was built between the 10th and 14th centuries. The monastery of Sanahin is on the right bank of Debed River. This architectural complex consists of several churches, seminary, book depository. The building of the seminary, which connects St. Astvatsastin (Holy Mother of God) and Allsaviour churches was from the outset built to make the edifices more earthquake resistant. Haghpat. Situated not far from Sanahin Haghpat monastery has its significant place in the historical and cultural life of Armenia. It was built during the reign of king Ashot Bagratuni. Numerous valuable manuscripts and miniature paintings have been produced in the scriptorium of Haghpat for many centuries. In the 18th century the famous Armenian bard Sayat-Nova used to live and create in this monastery. The belfry with its unique architectural composition is of stunning interest. Back to Yerevan . Overnight and dinner in Yerevan. Mass in the courtyard or in the Jamatoun Hamazasp in Haghpat. Day 8: Check out – Departure.